This article is a review of Memory Hrx. The manufacturer describes it as an herb blend that plays a significant role in supporting cognitive function and improving attention span. This product helps in boosting brain power, enhancing mental alertness, reducing aging, and improving the ability of the brain to retain information. You will learn more about the product as you read the rest of this article. Bacopa Monnieri or Brahmi– has anti-aging capabilities and helps to relief stress. It also boosts memory and enhances concentration. Brahmi also increases intellectuality and improves the cognitive function of the brain. It can treat several illnesses including headache, depression, anxiety neurosis, and learning disabilities. Centella asiatica or Gotu kola- known for supporting memory and the brain’s ability to recall facts. It is also an anti-aging herb, which can address some of the problems associated with aging. It also improves a person’s ability to concentrate and enhances mental health in general. It also facilitates retention and learning. Gotu kola also promotes the functions of the circulatory system and improves capillaries and veins. Convolvulus pluricaulis or Aloe weed- vital for supporting brain memory and brain health in general. Its functions include pacifying body imbalances, rejuvenating the body, and promoting intellectual ability. Aloe weed also treats several health conditions related to age. It helps the body to deal with stress, anxiety, blood pressure, and irritation. Research also suggests that this ingredient might alleviate depression and offer protection to the brain. Withania Somnifera or Ashwagandha – alleviates body imbalances and is useful for all types of weaknesses, as well as nervous disorders. Ashwagandha also helps the body to be stress resistant and gives the body the ability to keep vital energy during the day. It also maintains proper tissue nourishment and supports proper adrenal functions. Glycyrrhiza glabra or Licorice- memory booster because of its ability to enhance the brain’s analytical capabilities. Licorice also plays a significant role in rejuvenating the brain. It can also enhancethe circulation of blood and balance blood sugar levels. A container of Memory Hrx contains 60 capsules and each container offers 30 servings. Adults should take 2 capsules per day during meals. Users should wait for about two to four weeks to realize the promised benefits. There is a warning that users should discontinue taking the product in case of adverse reactions. Therefore, there are chances that adverse reactions may occur. A package of 60 capsules costs $24.99 on the company’s website, but it is cheaper on Amazon where it costs $15.18. This is a low price and it might raise quality concerns. There is no clear information about a satisfaction guarantee. On the other hand, a few positive customer reviews prove that Memory Hrx is a reliable product. 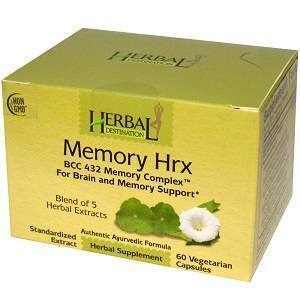 Memory Hrx is an appropriate product if you wish to enhance cognitive function, increase attention span, boost the brain, enhance alertness, and reduce aging. One merit of this product is that it consists of ingredients that are ideal for vegetarians. Moreover, this product is safe for consumption because it uses trusted herbs. However, quality concerns may arise due to the lack of a money-back guarantee and the low price of the product. Furthermore, there is a risk of experiencing adverse effects. Henry Costa	reviewed Memory Hrx	on June 14th	 and gave it a rating of 2.5.